Calgarians for Transportation Choice | A coalition of NGOs dedicated to healthy, active, vibrant, safe, & sustainable YYC communities that enable walking, wheeling, cycling, transit, carpooling, & carsharing. Thanks for reading and voting! Want to stay engaged? Consider joining one of our partner organizations as a member or volunteer. 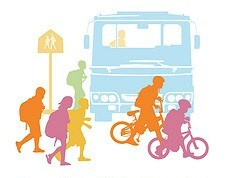 Calgarians for Transportation Chocie is a coalition of several Calgary-based non-profit organizations that work to improve traffic safety, to enable transportation options other than the private car (walking, cycling, public transit, carpooling & carsharing). We envision Calgary as a place where kids and adults alike feel comfortable walking, riding their bikes, rollerblading, skateboarding, or taking the bus to school or work. We think that everyone should be safely accommodated on our streets, from young parents pushing strollers, to seniors requiring a wheelchair, and everyone in-between. We drafted a list of questions related to traffic safety, liveability, and increasing transportation options for the candidates in the 2013 municipal election to answer. As traffic safety and the ability for kids to walk or bike to school is high on Calgarians’ minds, we’ve included questions for the candidates for school board trustee. We collected responses and made them available on this website. You can see the responses of our 2013-2017 City Council, or all responses by ward. Don’t know which ward you live in? Click here for a map. Continue to engage your elected officials, your friends, your neighbours, and your coworkers in a conversation about transportation options and traffic safety. Click “sign now” to add your name to our petition to tell our government that road safety concerns you. If you want to become more involved: any one of our partner organizations would welcome you as a volunteer.